Or so at least it seems to John Gray—the dark specter who, since the 1980s, has haunted British philosophy with a determination that seems to alternate between grim and gleeful. Somewhere along the line, Gray decided to be the rain cloud that spoils the picnic. The wedding guest who insists on talking about funerals. The neighbor playing "MacCrimmon's Lament" over and over on the bagpipes while you're trying to take a nap. 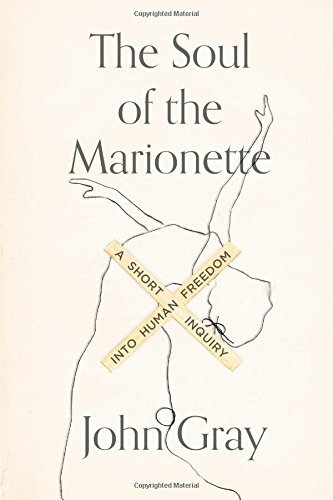 And now, with his latest book, The Soul of the Marionette, John Gray has reached his apotheosis, or as much apotheosis, anyway, as a self-proclaimed atheist can allow himself. All the darkness, all the refusal of cultural pieties, all the suspicion of politics, all the rejection of hope and hype—it's all here, rolled into a ball and held up as a denial of free will, political freedom, psychological amelioration, and historical betterment. This is a mean and narrow world in which we live, and we delude ourselves into even greater meanness and narrowness when we pretend otherwise. Born in 1948, the son of a working-class British family, Gray flourished at Oxford, emerging with his undergraduate and graduate degrees to teach at the University of Essex, Oxford, and the London School of Economics until his retirement in 2008. Beginning as a leftist, he turned in the 1970s to a more conservative position, driven by what he believed was the left's inability to see the changes being wrought by technology and economics. By the 1990s, he had arrived at what he claimed was a position outside all left/right political distinctions, culminating in his announcement of his atheism, his strong rejection of Enlightenment humanism, and his increasing environmentalism. Along the way, Gray wrote scholarly works on Mill, Hayek, Voltaire, and—perhaps most influential in his thought—Isaiah Berlin. The 1995 Enlightenment's Wake: Politics and Culture at the Close of the Modern Age and 1997 Endgames: Questions in Late Modern Political Thought presaged Gray's darker work, but it was really with the publication of Straw Dogs in 2002 that he seemed to feel himself set completely free to be the piper at the gates of darkness. And in subsequent years, he has poured out seven more books of complete rejection: Al Qaeda and What it Means to Be Modern, and then Heresies: Against Progress and Other Illusions, and then Black Mass: Apocalyptic Religion and the Death of Utopia, and then … and then … well, and then the new volume, The Soul of the Marionette: A Short Enquiry into Human Freedom. It's hard to put a simple statement of the many threads tangled together in The Soul of the Marionette. On its British publication earlier this spring, the Literary Review described the book as "a fugue of argument, aphorism and anecdote," while The Spectator asked its readers to imagine "Isaiah Berlin with a thing for sci-fi, occasionally lapsing into a Guardian op-ed." Names and ideas and whole swaths of history go flying by in the slim book's pages: Jeremy Bentham and Jorge Luis Borges, Baudelaire and the Aztecs, robots and Italy's Red Brigades, mannequins and magic. Through it all, however, Gray argues against Gnosticism—or, at least, the half of Gnosticism that finds the fleshy, muddy substrate of human nature a bar to human ascent. We humans must "exit from the material world," the ancient Gnostics insisted. To be free, we must "revolt against the laws that govern earthly things." It's all piddle, Gray declares. "Humans have too little self-knowledge to be able to fashion a higher version of themselves," he writes. We act, but we have no idea why we act, and the project of Gnostic ascent is a delusion. What's more, it's a delusion that hasn't faded. Just as Gray claimed uplifting Enlightenment humanism as spoiled Christianity in his earlier work, so he claims a number of recent movements as simply repackagings of Gnosticism for the hipsters of today. Transhumanism, robotic perfections, the singularity of Artificial Intelligence: "When thinking machines first arrive in the world," he notes, "they will be the work of flawed, intermittently lucid animals whose minds are stuffed with nonsense and delusion." And the fantasy that the machines will achieve the Gnostic ascent at which humans failed is just that—a fantasy, born of the Gnostic belief that it is our bodies, our material components, that have held us back.